ArchitectUI is built using the latest web development technologies and features more than 250 components, elements and widgets perfectly integrated with each other and always powered by the latest Bootstrap version (4.2.1). It features a modular frontend architecture making it easy to exclude the components that you’re not going to use in your app. It’s ES6 ready, powered by Webpack, which is responsible for compressing and concatenating the asset resources. All the stylesheets are built entirely using SCSS & variables, which makes things a lot easier if you want to customise the colour schemes, components or layouts. You can easily create your own dashboard pages or choose from one of the 9 already available. Also, there are 10 different colour schemes available, each with it’s own SCSS variables stylesheet. Developer License grants access to the private ArchitectUI Github repository so that you’ll never miss a bugfix or new release. The built in helpers make it easy to create basically unlimited color schemes for layout elements like sidebar, header, footer and main content. Also, each theme comes with 10 pre-defined color schemes for Bootstrap based elements. Each of our themes come bundled with at least 3 different layouts arrangements. For example, ArchitectUI Dashboard HTML PRO includes a sample Mailbox, FAQ Page and Chat dummy applications. We've included enough elements, widgets and components to cover almost all use cases for personal projects or clients apps. We continually adding new features and elements to our themes. Assets are logically split between NPM packages and local resources. SCSS file make it easy to include/exclude stylesheets or customize the look and feel from a single global point. Want to make, for example, the sidebar or header always fixed on screen? Easy, add the fixed-header parameter and voila. It's all explained in the documentation files. These options are available for all layout main components. 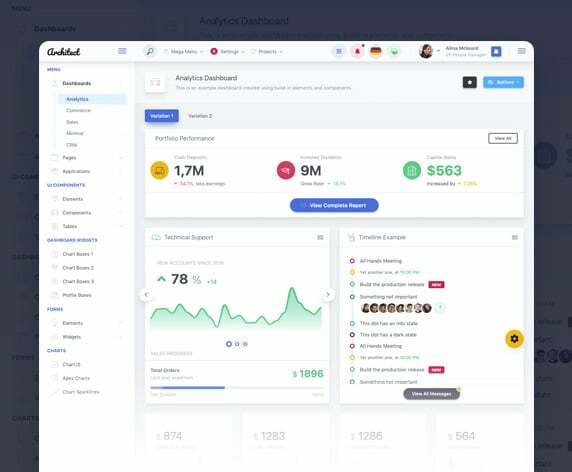 ArchitectUI Dashboard HTML PRO has 9 different dashboard designs included and fully coded that were built using only the included components and elements. You could easily merge together parts from existing dashboards to create brand new unique ones. ArchitectUI Dashboard HTML PRO works great on any screen size. From low-end mobile phones to Retina displays, it loads and acts perfectly. We always keep our components and elements updated with the latest available version. ArchitectUI Dashboard HTML PRO has it's own documentation files accessible either on DashboardPack.com or locally in the downloaded theme .zip archive. Over 300 Possible Color Schemes and Options Combinations available for Layouts and Components! ArchitectUI Dashboard HTML PRO comes with it's own individual documentation files available both online and offline in the .zip archive. ArchitectUI Dashboard HTML PRO is available on a private Github repository for all buyers. If you have a quick question, you can join the ArchitectUI Dashboard HTML PRO Slack dedicated channel. Submit issues, questions or support requests in our ArchitectUI Dashboard HTML PRO dedicated support forum. Get your Premium License Today! All our premium themes are covered by our Personal and Developer licenses. Purchasing the "Personal License" you will be able to use the purchased themes for yourself or your client project for 1 time. If you want to use it for multiple times, you need to buy another Personal License. Ownership and Copyright of our template will stay with DashboardPack.com after purchasing single use license. This means you are allowed to use our themes in your project and use for one client, but you are not allowed to create SaaS applications and sell those. No more than one developer can work with any of our themes, under the Personal License. Also you are not allowed to sell, distribute or lease our themes as it is to anyone. You have rights to use the purchased theme in a single personal or client project. You can modify the purchased theme as per your needs and use it for a single personal or client project. You can list the project you build with the purchased theme on your site / portfolio. You cannot use it for Multiple projects. You cannot resell, redistribute, lease, license or offer the product to any third party as it is. You cannot use it for any application / services / product for which end user can be charged for. You can not sell our UI Elements, Components or Layouts as is to anyone. You can not Use our themes to build Online / Offline Page Builders or Generators. Purchasing the "Developer License" you will be able to use the purchased themes for yourself as well as for your client projects. You can use product for unlimited projects and an unlimited number of developers can work with the purchased themes. Ownership and Copyright of our template will stay with Fiori after purchasing the Developer License. That means you are allowed to use our themes in your projects and for multiple clients. Also, you are allowed to create SaaS applications using the themes bought. You are not allowed to sell, distribute or lease our themes as it is to anyone. You have rights to use the purchased theme in unlimited personal or client projects. You can use the purchased theme for unlimited projects, both personal and clients. You can use the purchased theme for SaaS commercial apps/websites. You can list the project you build with our products on your site / portfolio.